The Xiaomi Mi Drone has been finally unveiled and is priced at RMB 2,999 for the 4K version and RMB 2,499 for the 1080P version, the cost is similar to the price of a mobile phone. It provides an affordable chance for those people who want to experience the joy of flying a drone, which used to be an expensive experience. The real question is: does Mi Drone really give us an easier approach to watching over the world with drones? Well, the day after the company officially released Mi Drone I participated in the conference held by Xiaomi in Yanxi Lack. And I got a short and incomplete experience of it. Does Mi Drone really succeed in shortening the barrier in the application of aerial photography? No, so far I think it does not change it. 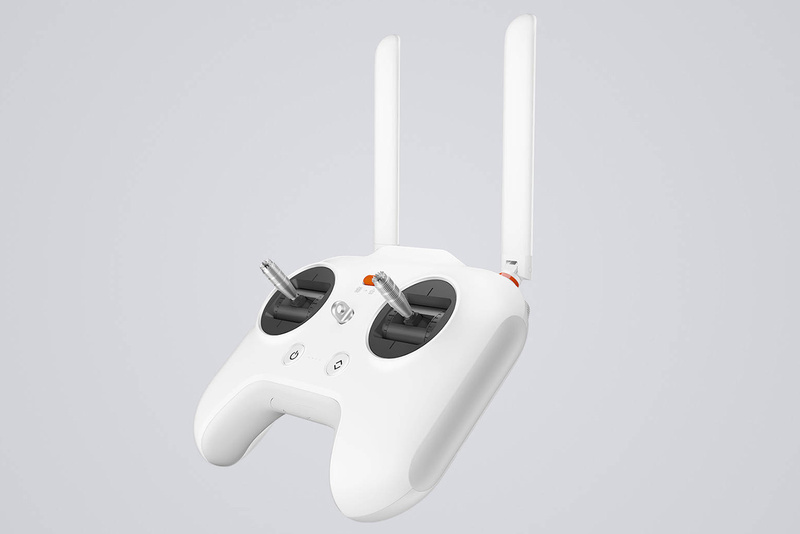 The 1080P version of Mi Drone uses a color palette of white and orange. The 4K version of Mi Drone has a color palette of white and gold. And also the Color is the only way to distinguish between 4K version and 1080P version when comparing by the appearance alone. when it comes to sizes, and you compare it to the DJI Elf Drone, a 434 mm rotor-to-rotor distance, may seem like a big object, but lucky for us the landing gear is foldable, Mi Drone is easy to carry and after folded, it can be packed into any backpack of 17 inches. Propeller protection frame: The major role of this is to protect the propeller while landing, or from the drone tilting that could be caused by landing on uneven ground, and does little to nothing for protecting people from cutting. Never think that the drone won’t hurt anybody just for being equipped this. The whole Built for Mi Drone is lightweight. An Optical flow auxiliary component can be found under Mi Drone. To be honest, I don’t know much about it, it seems to have a fine workmanship, though. There is nothing special about the remote control, it is comfortable but very common. It seems that Flyme put a lot of energy in developing the camera that can be found on the head, it has a fine look. The motor of the camera is hidden within the camera’s body. Also, the camera features a balanced construction that is able to avoid torque rotation, which can be caused by difference wind resistance while high-speed flying at 10m/s or more. The camera can be removed, however, it doesn’t support swapping between the 4K version and 1080P version. There are many plans for upgrades in the future such as: improving the portability of the camera, making the camera match with the handle, improvements to the contactor of camera and shock absorb module and also a feature to fix the camera into a handheld platform. It has a USB port and a Micro SD slot that can be found behind the camera alongside the heat vent. Mi Drone is power by a 5100mAh battery that can offer 27 minutes of continuous flight when the battery is fully charged. My flight time was very short, no more than 20 minutes in the conference. Mi Drone requires you to reach 300 minutes of flight time to release beginner mode and enter a more advanced mode, this is because the Mi Drone experience is totally new, for such reason the flight speed, flying altitude, and some shooting functions are limited at the time. So I can say that I experienced a limited Mi Drone version in a very short time, therefore, I have no qualification to make a conclusion about its performance. But briefly talking about the experienced time, Mi Drone’s hovering stability is quite good, we barely saw the body shaking in a wind with force type 3. When the joystick is suddenly released during flight, Mi Drone can rapidly enter hovering mode. This is quite good, the reliability is basically at the same level of the DJI Wizard 3 zero explorers that I have used before, and even better than some smaller brands with similar products. Since in beginner mode the orbit, flying path plan, and fixed-point mode are locked, I couldn´t select them or change them. I tried the auto-return function, which was satisfactory. While flying at low altitudes, Mi Drone would fly up to 10m height, then accurately fly back to the takeoff location and the propellers will automatically stop after landing. One thing should be noted that after using the auto-return function you must be sure to toggle the homing switch on the remote, otherwise, the drone would be unable to take off again. About the actual image transferred effect, I can tell you that most of the time the 720p image transferring signal has a good performance with great clarity and fluency, but it occasionally has the phenomenon of mosaics or standstill. Due to the beginner mode, we only flew up to 150m away. I do not know the performance of the image transferring system while flying further than that. Which version should I buy, 4K version or 1080p version? Besides the different resolution, the flight control systems, and the image transferring system there are quite some differences that you need to know. The 4K version uses MIMO image transferring system that has an effective flight distance of 2km, while the 1080P version uses a Wi-Fi image transferring system that offers 1km of effective flight distance. I think that due to the fact that the performance of the image transferring system is directly related to the flight experience, RMB500 is not a big gap, therefore, I recommend the 4K version. But it’s said that more versions will be released, such is the case of a 1080P version that will combine the 4K version’s image transferring system. There will be a more high-end choice of Mi Drone? To the present day, the answer is “No’. 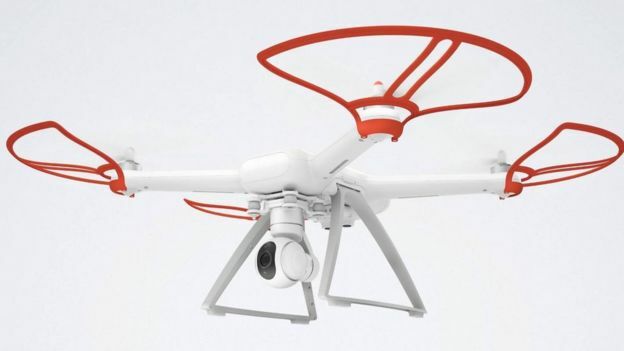 This time, Xiaomi’s attitude towards the drone is avoiding any kind of mistakes. This product is made for market testing. And a follow-up product plan will be issued in the future. Moreover, Xiaomi also hopes to separate itself from the competition with products such as the ones from DJI. So soon, there should not be more Mi Drone devices at the same level of the DJI´s drones. Does Mi Drone supports camera upgrades or will feature GoPro cameras? No. Since there are too many differences in the image transferring system and the flight control systems, Mi Drone´s camera will only match their corresponding version. Furthermore, since GoPro’s agreement is not open, the shooting parameter control cannot be achieved even if you manage to mount it on a drone, Mi Drone currently has no plans to support GoPro components. How much will the battery, handle and propeller cost? Battery, handle and propeller will start selling soon in Xiaomi.com. The price of the handle and propeller is unclear, the battery will certainly be priced within 500 yuan to ensure a competitive price. Xiaomi deliberately designed a propeller with metal and plastic parts, and buying the plastic blades should be a cheaper option than buying the whole propeller. Buy or not buy, please judge your flight conditions, this is a decision that you need to think very carefully. For instace, if you live in the city of Beijing, where most of the area belongs to a no-fly zone, and you don´t have a car, you may spend three or four hours traveling until you are finally able to fly the drone for less than an hour, situations like this could easily deter you from buying a drone. But if you often have the chance to go to outdoors and traveling, buying a drone is a good choice. As for Mi Drone, I think it depends on your budget. Why does the 4K version will be released so late? The main reason is that the camera of the 4K version uses a Sony’s back-illuminated CMOS sensor. The earthquake in Kumamoto Japan had a great impact on the supply of Sony. Flymi has accepted to line up until July in order to get sufficient amounts of these sensor chips. So naturally the release date will be delayed. What is the position of Mi Drone? Very conservative, improving the basic functions, and avoiding any kind of mistakes. I think security comes first, after that the new flight control technology or new functions such as connecting with Xiaomi bracelets, etc. Xiaomi can do everything from the aspect of technical and R & D team, but as an influential brand with large scale, and since they are just entering the field of drones they cannot afford to make mistakes, especially when it comes to security. So finishing the general basic functions is enough for now. How is a typical consumer of Mi Drone like? I think most of them are primarily enthusiasts who are interested in drones but are limited by their acquisitive power. We also believe that Xiaomi is a big brand, it won’t make big mistakes such as unreliable products provided by rough manufacturers. A solid customers base, alongside reasonable prices, looks really promising. So, I think as long as there are no major bugs or troubles with Mi Drone, and with the sufficient supply, it is unnecessary to worry about the sales. The brand of Xiaomi and its trend to push the prices lower and lower is a force to be reckoned with. But can we say that Mi Drone is really lowering the barrier of drone applications? Absolutely not. The price will attract a lot of amateurs, and drones are not toys. High-speed rotating propellers are dangerous for people, the newcomers don’t have a correct concept of what this means. Imagine, it would be a scare thing that more and more drones started showing up due to the low price. Unless the space above the city is a no-fly zone, it is hard to avoid drones for hurting people or hitting cars. For Xiaomi a great brand with Influence, they have the responsibility of educating their users. Otherwise, if there are sufficient numbers of drone damages events, an unfavorable policy level situation is likely to occur in the middle of the drone´s development. The worst of cases would be the comprehensive ban of personal drones. For Xioami, it’s important to use the offline and online resources so that they can properly explain what it means to fly safely to the Mi Fans, drone enthusiasts and potential users. Now Xiaomi provides flyer insurances and third party liability insurance, but these are only after the event has happened. The top priority for Xiaomi is to improve the safety awareness of the flyer and with that, reduce the frequency of accidents. As for the medias, we have to teach basic drone knowledge to the public, we have to teach them that we have to be careful while flying even if it has a low cost, otherwise, it would be a horrendous development for the drone industry. Drone Airline – What Does it Mean for the Drone Industry?